River Valley Times Reporter - The Van Vleck Ranch, a Rancho Murieta icon, was among 44 inductees to the California Agricultural Heritage Club honored at a ceremony and brunch on July 30. The ranch was announced at the California Exposition and State Fair as an inductee in the category of 150 years of continuous operation. There were just 11 California agricultural entities inducted in this category for 2010. Van Vleck Ranch reached the 150-year milestone in 2006. 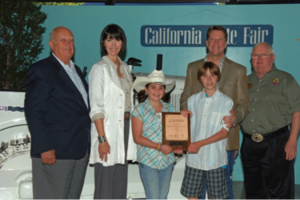 Recognition is awarded to California farms, ranches, organizations and agribusinesses that have preserved an economic standard in the state with a minimum requirement of one entire century. According to Stanley O. Van Vleck, president of Van Vleck Ranching and Resources, Inc., this kind of longevity is no ordinary feat. But dedication to purpose is a Van Vleck family legacy. Van Vleck’s great-great-grandfather, Amos, traveled 2,000 miles to California in a covered wagon in 1856, settling and establishing a ranch in the Camino area. The family migrated down to Sacramento County in 1917 and established the ranch that still thrives along Highway 16 in Rancho Murieta today. Since coming to Sacramento County, the Van Vleck family has done a great deal to pay it forward by benefiting the RM community and the greater Sacramento region. Philanthropic uses of their land are enjoyed by several organizations that train there including the Operating Engineers Local Union No. 3, Sacramento Metro Fire Department, Sacramento County Sheriff’s Department and the military. In addition, 20,000 Boy Scouts come through the ranch each year as part of their educational scouting experience. Sac Metro was also permitted to erect an emergency communications response antenna on the Van Vleck land to help protect RM. Van Vleck Ranch is a 10,000–acre operation that produces hay and cattle and mines sand, gravel and clay. The ranch is also home to two paintball facilities and a recreational horseback riding operation.